Is It Over For John McCain? "It then hit the personal animosity of the advertising and then I thought McCain swerved off track...He got overemotional about it. He looked angry. And it was almost an exercise in anger management up there for him to contain himself. And Obama maintained his cool, and I thought that changed the tone of the debate and Obama won the last half hour. I thought Obama really did well on education, abortion and health care." Then the polls came in. Obama said he wanted somebody who is "prepared to be president" and who will be "a partner with me in strengthening this economy for the middle class and working families." He said he was looking for not just a partner but a sparring partner. "I want somebody who's independent, somebody who can push against my preconceived notions and challenge me so we have got a robust debate in the White House." He was just asked who he thought Senator Obama should pick…he said the criteria should not be a political one (eg should not be whether VP can deliver a state) but rather who is ready to be President should something happen. He then said the choice should be Senator Hillary Clinton. The Atlantic has released a series of internal memos from the Hillary Clinton campaign. The memos are here. ....What is clear from the internal documents is that Clinton’s loss derived not from any specific decision she made but rather from the preponderance of the many she did not make. Her hesitancy and habit of avoiding hard choices exacted a price that eventually sank her chances at the presidency. Greg Sargent at Talking Points Memo and the Caucus at the New York Times provide some analysis. Jake Tapper at ABC News suggests the memos "appealed to prejudice" and in this later post, refers to a memo written after Iowa in which Mark Penn talked about "releasing the tapes" to counter Obama. Tapper asks, "What tapes?" The unity train took off today with Hillary Clinton and Barack Obama's joint appearance in New Hampshire. Some Hillary supporters are on board. Others are not. Your thoughts? Mine are simply this: I wasn't impressed by the joint appearance, but I'm voting for the Democratic nominee and since that's Barack Obama, I'm voting for him. A Democratic source with knowledge of the situation said Obama instructed members of his national finance committee during a conference call today to help Clinton with some of the $10 million she owes to vendors. The former first lady, who exited the Democratic contest on June 7, ended May with $22.5 million in debt, more than half of it from personal loans to her campaign. I wonder if he used the word "some" as a limiter and if so, why? Why not just ask them to help her with the $10 million she owes to vendors? It seems to me she will be raising more than that amount for him during the general election campaign from her donors who maxed out to her. Why wouldn't he ask the same of his big donors? Again, this is only about the amount she owes to third parties. Hillary is not asking anyone to reimburse her for the $10 million she loaned her campaign which she has said she views as her personal investment. Hillary and Obama to Jointly Campaign in Unity, N.H. The site of the first joint cammpaign appearance where Hillary Clinton will be campaigning for Barack Obama has been announced: It's Unity, NH. The joint appearances even have a name now: Unite for Change. Dateline: Aspen. I was able to hear the last ten minutes of Hillary Clinton's speech. I thought she was great. As one of her supporters, I am going to honor her wishes. She could not have been more clear. Sen. Barack Obama is the Democratic nominee. 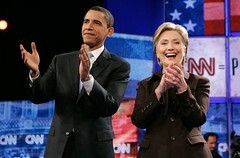 The 18 million people who voted for her should now enthusiastically support Sen. Barack Obama. Even if you thought Hillary was the better candidate for President, she is no longer in the race. That is not going to happen. What matters now is that we put a Democrat back in the White House. We must all work for that. The alternative , a John McCain presidency, is simply unacceptable. The race is over. Let's get past it and look forward. I'm past it. I thank Hillary for her commitment, her resolve and her passion. She inspired millions of us. She will continue to inspire, lead and work to improve our lives -- just not as President. TalkLeft is proud to now officially declare, "Barack Obama in 2008." He has our full support. "While Senator Clinton has made clear throughout this process that she will do whatever she can to elect a Democrat to the White House, she is not seeking the vice presidency, and no one speaks for her but her. The choice here is Senator Obama's and his alone." As I've opined several times, if Hillary doesn't want the Vice-Presidency, we should honor her wishes. BTD believes Obama has a better chance of winning if Hillary is the nominee. That's one consideration, but it's not the only one. I believe Obama needs to win the White House on his own, with support from those who believe he's the best choice for the country. While I believe he's a far better choice than John McCain, I don't believe we should force Hillary into thinking she owes it to him or the party to be on his ticket. She's given enough. Sen. Barack Obama's Vice-Presidential selection team is now in place. It includes Former Deputy U.S. Attorney Eric Holder, Caroline Kennedy and "Democratic insider" Jim Johnson. Obama said today he'd be speaking with Hillary over the next few weeks, but didn't mention whether the VP slot would be one of the topics. CNN asks, can he afford not to offer her the position if she wants it? I don't know if she wants it or not. If she wants it, I'm all for her having it. What happens if it's disclosed she wanted it and wasn't offered it? I imagine many of her 18 million supporters would be quite displeased. 4:45 pm: Terry McCauliffe tells Wolf Blitzer Hillary absolutely will not drop out tonight. He says he and Hillary are making superdelegate calls. She has more voters than any other candidate in presidential primary history. "We're still going." Laugh of the segment: Going into a commercial break, Wolf says: "But could the superdelegates still sway her way? Come back and we'll ask our expert, Donna Brazile." These threads are filling up fast. We need some topical music video suggestions. Ideas? The AP, which still has egg on its face from this morning's false report that Hillary would concede to Obama, does it again. The AP is sending out a breaking news report, complete with post-mortem analysis, that Obama has reached the magic number and is officially the nominee. Votes are cast at the convention in August. Superdelegates can change their mind any time before then. If this went to an open convention, even pledged delegates would be released from their pledge after the first vote. This does not mean it's going to the convention. It means that until one candidate drops out, there can be no winner because the number of delegates that candidate has can change any time until the convention. Until and unless Hillary Clinton publicly suspends or ends her campaign and concedes that Obama is the nominee, there is no nominee. There is only a statement that if current delegate positions at this moment were frozen in time until August he would be the nominee. If and when Hillary makes that determination, then Obama will be the nominee. At that point TalkLeft will congratulate him and offer him our support. We're not there yet. Let's look at the states that voted in March, April, May and now June: Hillary has won 8, Obama 5 . Hillary won: Ohio, Rhode Island, Texas, Pennsylvania, West Va., Indiana, Kentucky and Puerto Rico. Obama won: N.C, Oregon, Miss., Wyoming and Vermont. Update: Reporters quizzed Obama about Rezko today in Texas. Chicago Sun Times reporter Lynne Sweet disagrees with Obama advisor David Axelrod that Obama answered the media's questions about Tony Rezko. In addition to her own experiences, she points to this April 27, 2007 news clip. For more than a year, that has been a pretty small group of investigative journalists—from the Chicago Sun-Times and the Chicago Tribune. I checked with the Sun-Times reporters before I wrote my column and rechecked again. They all said they have never had a chance to discuss Rezko with Obama.